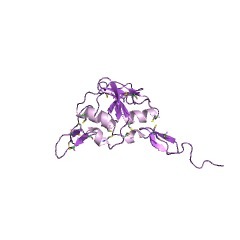 This domain is found in complement component proteins, complement component factor 1 and agrin. Complement components C5b, C6, C7 C8 and C9 are the constituents of the membrane attack complex (MAC) that plays a key role in the innate and adaptive immune response by forming pores in the plasma membrane of target cells. Its assembly is initiated by protelytic cleavage of C5 into C5a and C5b. C5b binds sequentially C6, C7, C8 and multiple copies of the pore-forming subunit C9. Factor I is responsible for cleaving alpha chains of C4B and C3B in the presence of the cofactors C4-binding protein and factor H respectively. Agrin is a component of the basal lamina that causes the aggregation of acetylcholine receptors and acetylcholine-esterase on the surface of muscle fibres of the neuromuscular junction. There are 701 FIMAC domains in 355 proteins in SMART's nrdb database. Taxonomic distribution of proteins containing FIMAC domain. This tree includes only several representative species. The complete taxonomic breakdown of all proteins with FIMAC domain is also avaliable. Click on the protein counts, or double click on taxonomic names to display all proteins containing FIMAC domain in the selected taxonomic class. Possible arrangement of the five domains in human complement factor I as determined by a combination of X-ray and neutron scattering and homology modeling. 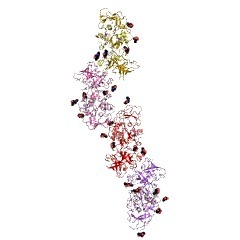 Human factor I is a multidomain plasma serine protease with one factor I-membrane attack complex (FIMAC) domain, one CD5 domain, two low-density lipoprotein receptor (LDLr) domains, and one serine protease (SP) domain and is essential for the regulation of complement. 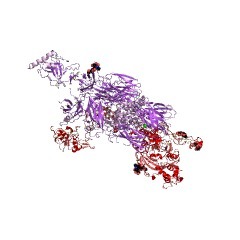 The domain arrangement in factor I was determined by X-ray and neutron scattering on serum-derived human factor I (sFI) and recombinant insect cell factor I (rFI). While the radii of gyration of both were the same at 4.05 nm and both had overall lengths of 14 nm, the cross-sectional radii of gyration were different at 1.70 nm for sFI and 1.57 nm for rFI. This difference was attributed to their different means of glycosylation which is complex-type for sFI and high-mannose-type for rFI. 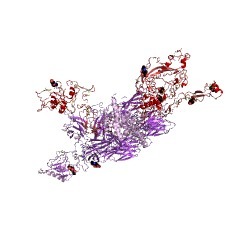 Homology models were constructed for the FIMAC, LDLr, and SP domains of factor I using related crystal structures, and CD5 was represented as a globular protein by referencing its electron microscopy dimensions. In these models, 38 of the 40 Cys residues in factor I were predicted to form internal disulfide bridges. 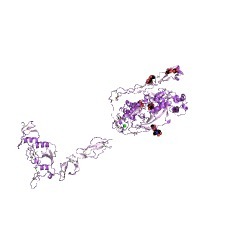 The two remaining Cys residues at the N terminus of the FIMAC domain and at the center of the first LDLr domain were potentially not bridged. It was postulated that, if these two Cys residues were bridged to each other, the FIMAC, CD5, and LDLr-1 domains would form a compact triangular arrangement. This hypothesis was tested by automated scattering curve fit searches based on 9600 bilobal models, setting the FIMAC, CD5, and LDLr-1 domains as one lobe and the large SP domain as the other lobe. The searches gave a single small family of similar structures with a separation of 5.9 nm between the centers of the lobes which gave similar good X-ray and neutron fits for both sFI and rFI, despite the different glycosylations of sFI and rFI. These best-fit structures for factor I showed that this domain model is plausible, and suggested that the SP and the CD5 and LDLr-1 domains may present exposed surfaces in factor I whose roles are to interact separately with its substrates C3b and C4b and with cofactor proteins. This information is based on mapping of SMART genomic protein database to KEGG orthologous groups. Percentage points are related to the number of proteins with FIMAC domain which could be assigned to a KEGG orthologous group, and not all proteins containing FIMAC domain. Please note that proteins can be included in multiple pathways, ie. the numbers above will not always add up to 100%. 2wcy NMR solution structure of factor I-like modules of complement C7.